So far in this series, we have been building a notes app. We have built a local store (called a content provider) for the data and integrated Amazon Cognito into the standard Android Accounts page. Now it’s time to consider synchronization of data. Synchronization is considered in two parts: a backend component and a frontend component. 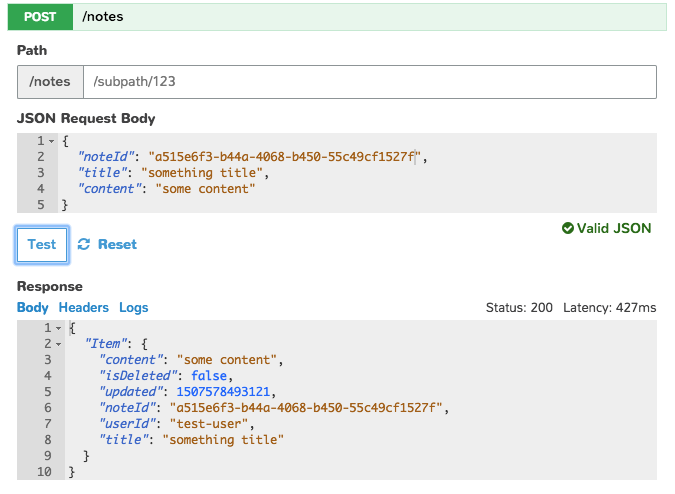 The POST /notes endpoint allows us to inject data into the DynamoDB table. For this example, there are no sequencing issues. I can update each record independently of all the others. Sometimes, you need to code sequences and handle conflict resolution accordingly. For example, if you produce a CRM application, you may want to add customers before adding the opportunities for those customers. The GET /notes is the incremental sync endpoint. It returns any record that was updated since the last synchronization. Again, you may want to ensure proper sequencing in a more complex app – sync the customers before the opportunities. As we mentioned when developing the content provider, there is a client-side model and a separate server-side model. The two are generally not the same. Sign in to the AWS Mobile Hub console and select your project. Click Example to start with an example schema. Click Notes as the example schema to use. Enter isDeleted as the Attribute name. Select boolean as the Type. Enter updated as the Attribute name. Select number as the Type. On insert/update, you search for the noteId + userId combination. On retrieval, you search for the updated + userId combination. Enter DateUpdated as the index name. Select userId as the Partition key. Select updated as the Sort key. You are now ready to create the table. Click Create table at the bottom of the page, and then confirm the action. It takes some time to create a table, but you can see the progress on the screen. As a best practice, you should not directly expose your database to the internet. Instead, you should think about the operations your mobile app performs on the backend, and then write secure APIs to perform those functions alone. In this case, you want to ensure that the userId is the authenticated user before insertion. This is done within an AWS Lambda function that is exposed to the internet by Amazon API Gateway. API Gateway ensures that the request is signed (so it is less likely to be from a rogue mobile app). All requests are required to be authenticated, which further reduces the risk. Enter sync as the API name. Select Restrict API access to signed-in users. Replace /items with /notes (click the pencil icon next to /items, and then click the tick icon). Enter notesSyncHandler as the Lambda Function Name. It takes a couple of minutes to create the API. After the API is created, the infrastructure part is done. You now need to introduce some code to do the work in the backend. To do that, click the Actions drop-down and select notesSyncHandler under EDIT BACKEND CODE. This opens the AWS Lambda console so you can edit the code. You can also see the headers and logs for the transaction. However, you do not see the console log from AWS Lambda. Click Edit function in Lambda console to enter the Lambda console. Click Monitoring to see basic statistics for the Lambda execution. Then click View logs in CloudWatch to see traces for individual executions. You can see the console log within CloudWatch Logs. This enables you to debug executions even when the execution is coming from a mobile phone that you do not have access to. Let’s move on to the main problem – writing the API code to handle synchronization events. You can replace the calls to baseHandler() in your code with calls to specific handlers – postHandler() and getHandler(), for instance. Each handler can do the requisite work, returning an appropriate message. DynamoDB provides an asynchronous API you can use. MOBILE_HUB_PROJECT_REGION is the region where resources are deployed. MOBILE_HUB_DYNAMIC_PREFIX is the prefix for generated resources, such as the DynamoDB table. MOBILE_HUB_PROJECT_NAME is the (non-unique) project name you provided. message: "Object must include noteId"
Go to Resources and click the Notes table link. Then click the Items tab. Ensure your record is inserted into the database. Go to the CloudWatch Logs console to see the logs that are generated as a result. 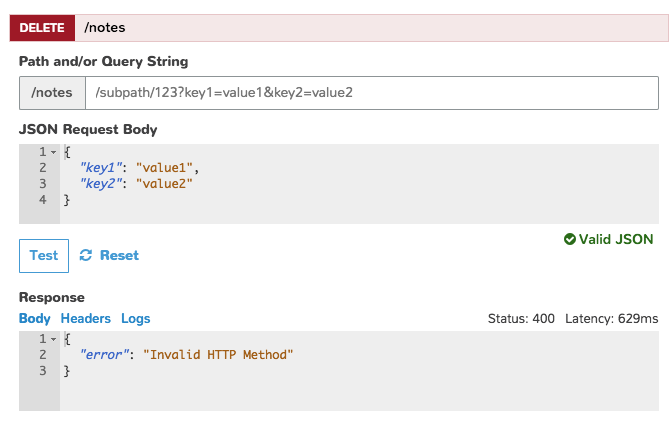 Play around with the Cloud Logic API tester and note what happens when there is an error in the data that you provide. Usually, it generates a 400 response. Note that the combination of noteId + userId must be unique. This means that one user cannot overwrite the work of another user. Also, because you restricted the API to users that are logged in, the API cannot be used by rogue actors who are trying to circumvent the security you put in place. Note that there may be other security corner cases that can result in a malicious actor misusing the API after the user is authenticated. However, the exposure is reduced by using a combination of API Gateway, Lambda, and DynamoDB for the service-side data handling. Insert several notes using POST, and then search for all of them by doing a GET with no query string. 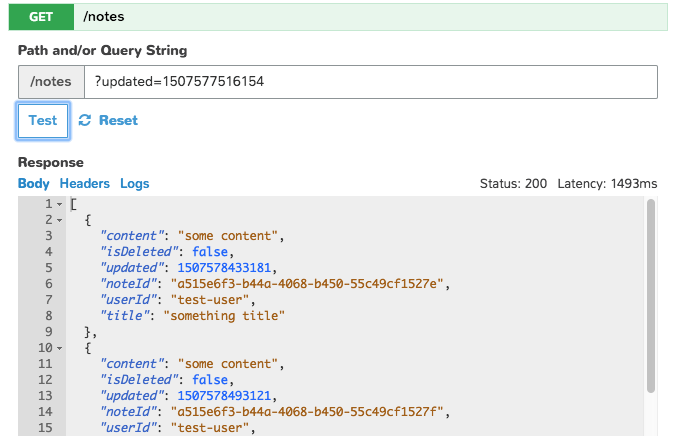 Pick a time somewhere in the middle of the set, and then add the ?updated=value query string and verify that only some of the notes are returned. The code we present here has a “last write wins” policy, which does not allow for conflict resolution. More code would be necessary to write something that can detect conflicts and report those back to the client for handling within the UI. This is only one half of the synchronization code. In the next post, we walk through the mobile client side of the synchronization code.